Hi all! 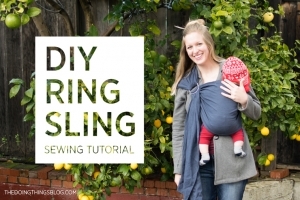 I am so excited to share my favorite knit fabric today! 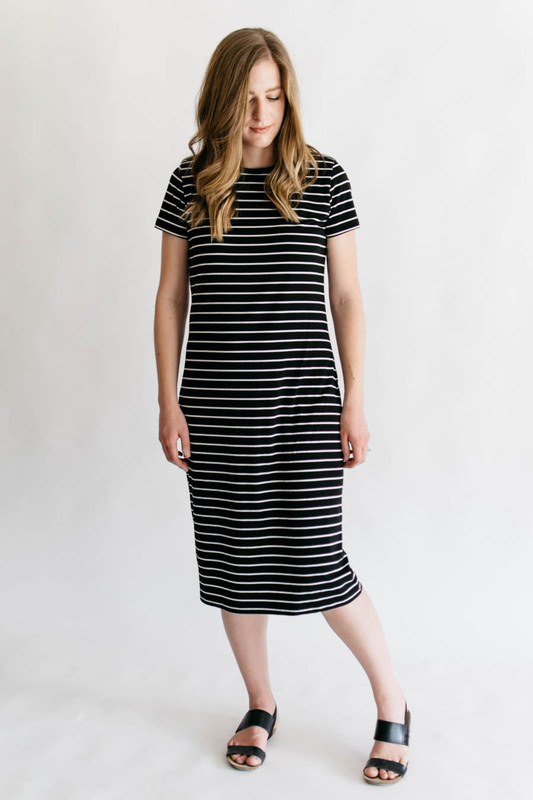 Striped tees and dresses are my love language, and if they happen to be black and white – I fall head over heels. 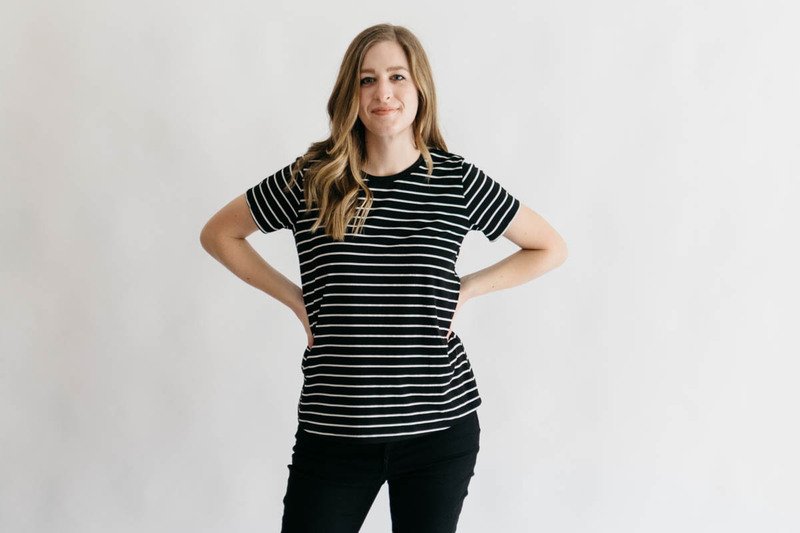 When I saw Heidi (@handmadefrenzy) make a bunch of tops out of the white fabric with black stripes a few months ago, I was seriously debating on buying it because buying knits online can be really difficult and frustrating. 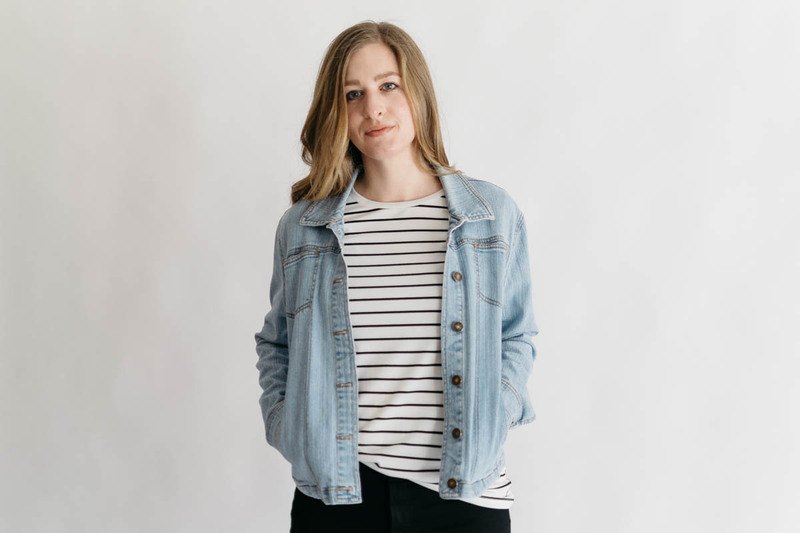 But when she mentioned in her Instagram stories that it was the most amazing jersey knit she had ever sew, I was WAY on board – Heidi sews a TON, so I knew it had to be good. After I got it, I immediately made a Monroe Turtleneck (sans turtleneck; pictured above), and fell in love! When I went back to buy more of this fabric (before it all sold out again) I got chatting with owner of D&H, Tammy, and she was planning on getting more of the fabric in black, with white stripes. 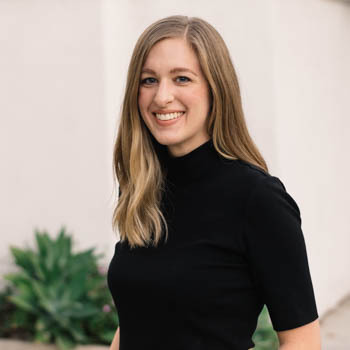 I was SO excited that all of my Pinterest dreams were coming true, because SO much of what’s on my clothing inspiration boards are just black and white striped things, and that’s really hard to find for some reason! I love both of the stripe combinations so much and wanted to share what I made with the extra white fabric that I purchased (out of stock, sorry!). 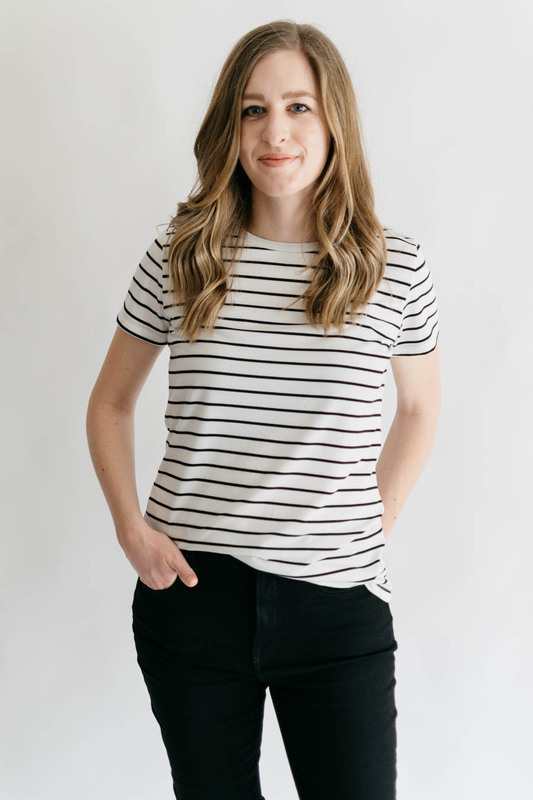 I was very predictable and made the Panama Tee, but before you roll your eyes at me – I have my reasons! 😉 The Panama fits me so well, and I love that it’s more of a fitted tee pattern. I feel like the white fabric is a little more dressy, so I didn’t really want the tee to be too loose/have too much ease. I also have a few white shirts on my Pinterest board pinned that were more fitted. No reason to reinvent the wheel if you have a pattern that you love! 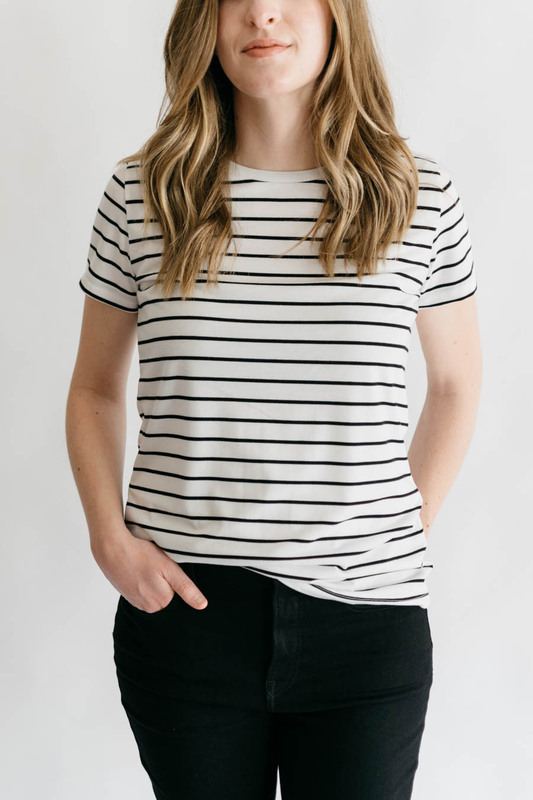 Tammy was so kind and sent me enough of the black with white stripe jersey to make another tee AND a cute casual knit dress for summer. 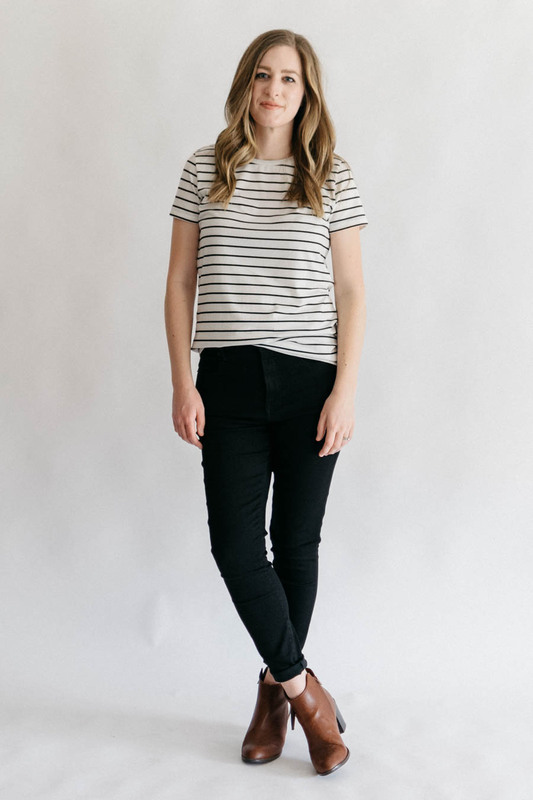 The black striped tee in this post is the Union St. Tee by Hey June Handmade. 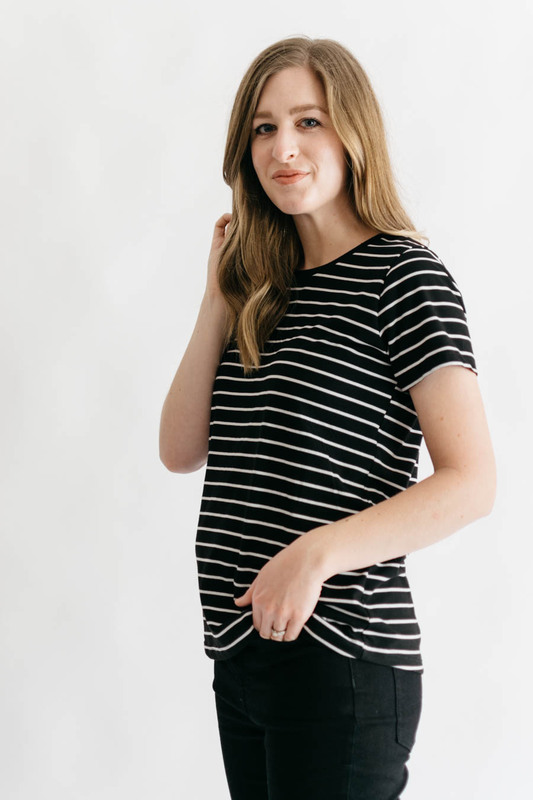 I love this pattern because it has a bit of ease, so it’s more like a comfy tee instead of being very form fitting. 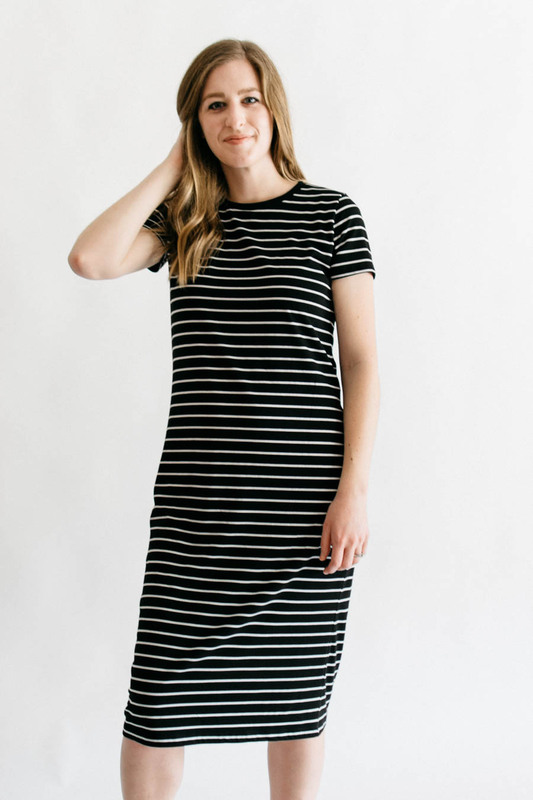 My dress is the Panama Tee Dress by Alina Design Co. I’m not exaggerating when I say I have made this pattern two dozen times now. I LOVE it! It works really well for me, and it worked really well for this fabric. Stripes look good sew up in many different ways. 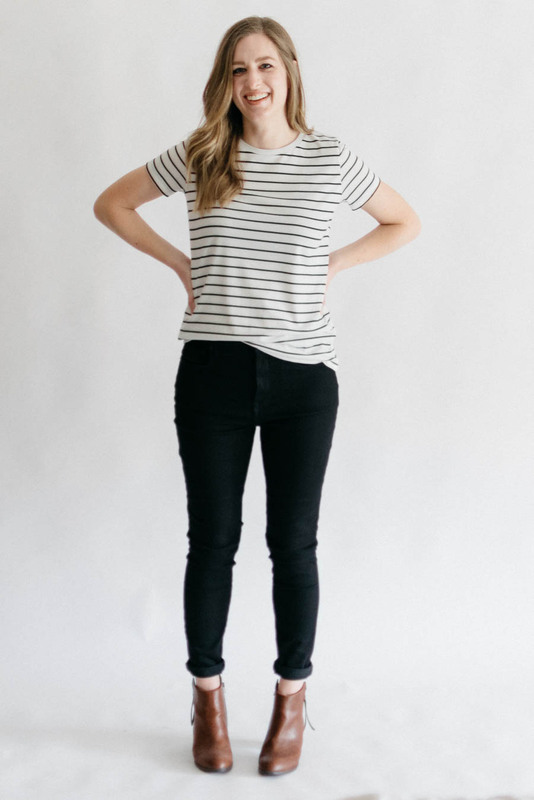 The basic tee and tee dress, like the Union St Tee and Panama Tee Dress, are my favorite. But they also work really well with shirts that have a drop shoulder (ex. 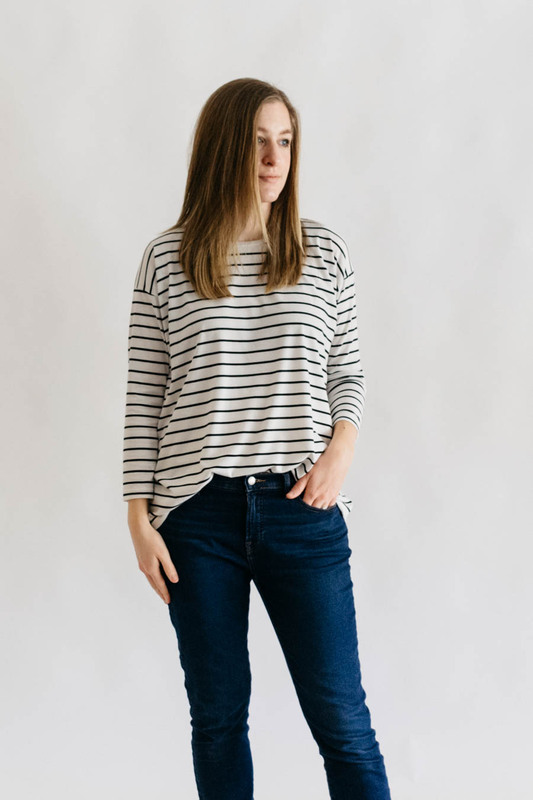 Santa Fe Top or Stellan Tee (free pattern)). My other favorite way to see them is with turtlenecks, boxy or more form fitting (ex. 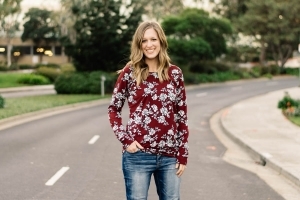 Monroe Turtleneck (free pattern) or Nikko Top). I wish that I could sew more long sleeves, but I don’t get to wear them as often living in California, and I want to wear this fabric to the max! So, those of you who live in cooler climates need to sew this fabric in some gorgeous long sleeves so that I can live vicariously through you. I might be a little obsessed, because almost half of the clothing I’ve Pinned on Pinterest has been black and white striped knit things! I even went through my clothing inspiration board a while ago and deleted a few b&w striped things because it was getting excessive, and I was like, ‘Okay Tori! I get it! 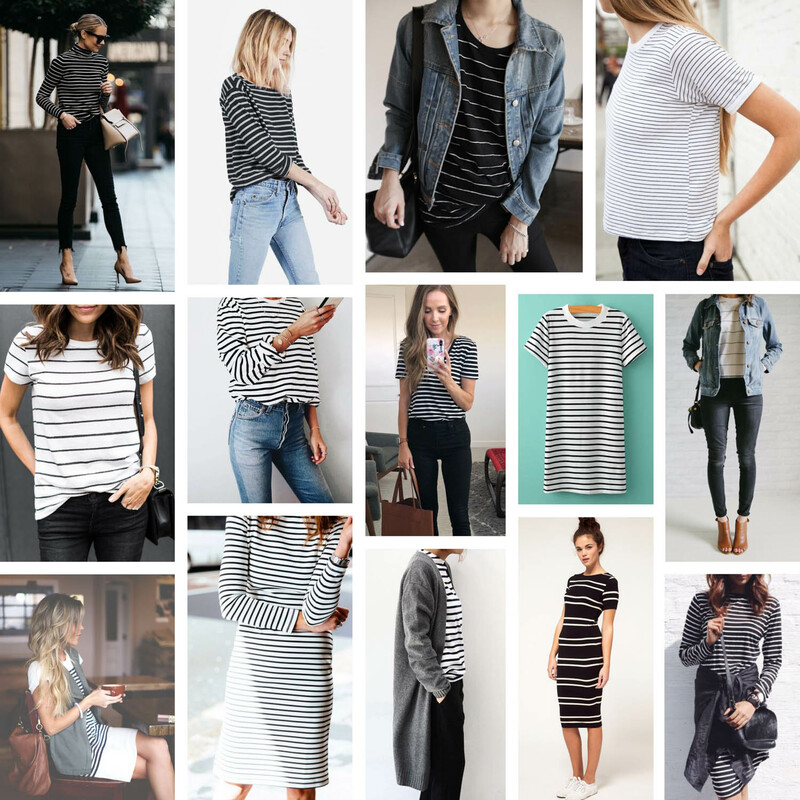 You just need more b&w striped clothes!’ If you don’t believe me, here is a mood board of every b&w striped thing on my Pinterest board, PLUS a few things that I remember seeing, but restrained from pinning. 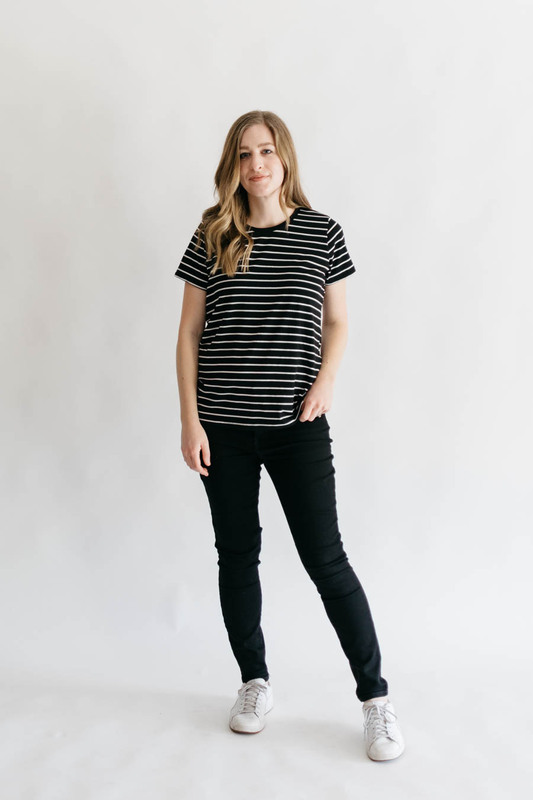 I just really freaking love black and white striped tees – no matter the combination – because they are such a good base for an outfit. You can basically wear any pants, shoes, or jacket/coat with them and still look put together. 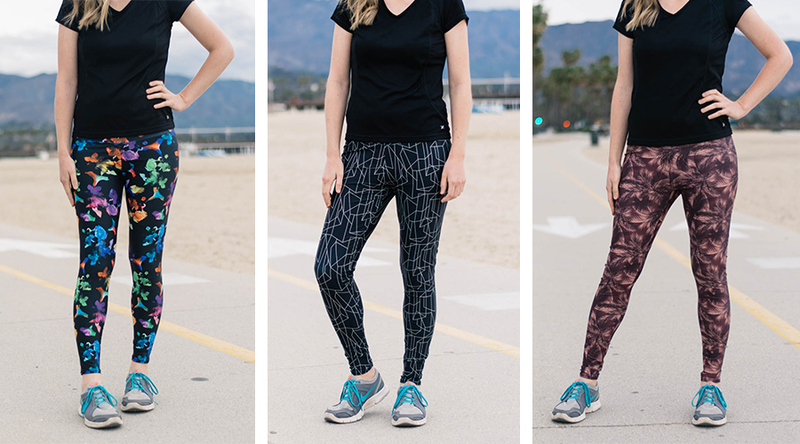 They are so easy to dress up or dress down in like a cool, but comfortable way. 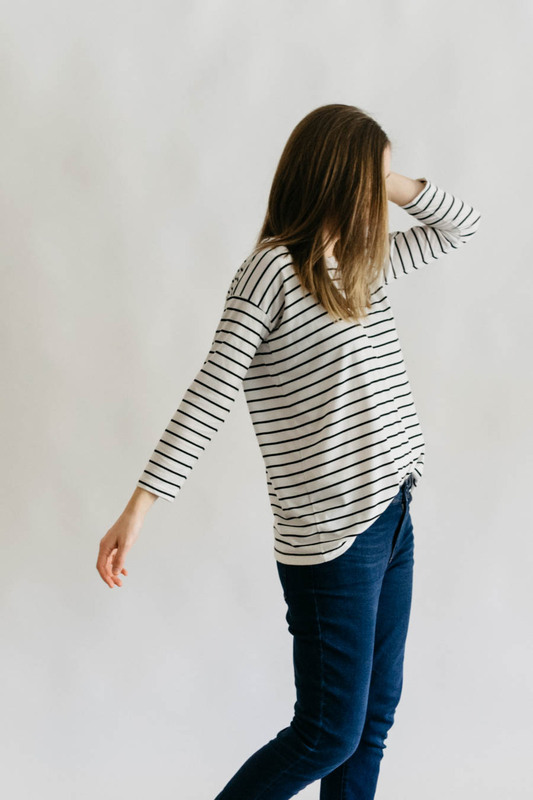 They match basically everything, so getting dressed gives me so much less stress when I can just throw on a striped tee and pair it with whatever else I’m in the mood to wear. I love wearing them with a good pair of blue jeans, but paired with black jeans is probably my favorite with some cute loafers or white tennis shoes. Being a stay-at-home-mom means they are paired with joggers and a cozy cardigan about 50% of the time. And with the weather warming up, I will definitely be wearing them more with shorts and sandals more often. 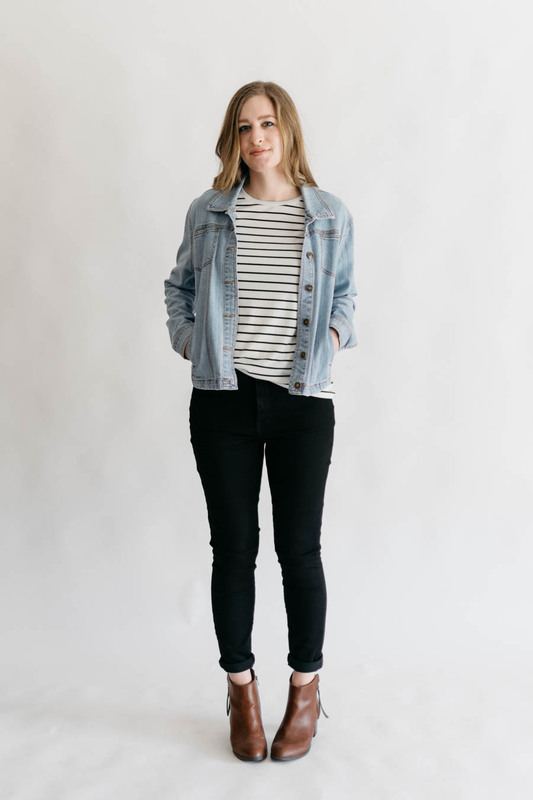 I have quite a few striped tees with denim jackets on my Pinterest board, and I wanted to try wearing one to see how I would like it, but I didn’t want to pay for a brand new one OR go to all the work of making one to find out it wasn’t really my style. (Also, my husband has told me in the past that he doesn’t really like them.) So I found my light jean jacket at a local thrift store, and I also found the darker one at my local Goodwill. Score! And surprisingly, my husband was a really good sport by helping me find them, and he seems to like them! So, I think a Hampton Jean Jacket may be in my future. For those interested in the adjustments I made to all of these pieces, I always add 2″ to the waistline for the Panama Tee. I measure at a 10 in the bust and 12 in the waist and hips for the Panama, but when I’ve made the 10, graded to a 12 it’s a bit too snug. So with this top I made a straight size 12. For my Panama Tee Dress, I made it a 12 in the bust and graded to the size 14. In addition to the 2″ I add to the waistline, I also add about 7″ more to the length. I reeeaaally like how this dress fits! For the Monroe, I added 2″ in length and had to redo the sleeves because the Monroe and Mandy Boatneck patterns by Tessuti have unusually tight sleeves (and I have pretty slim arms!). So I actually tried the sleeves up to the Panama Tee sleeves, and I think widened them by 1″ total. 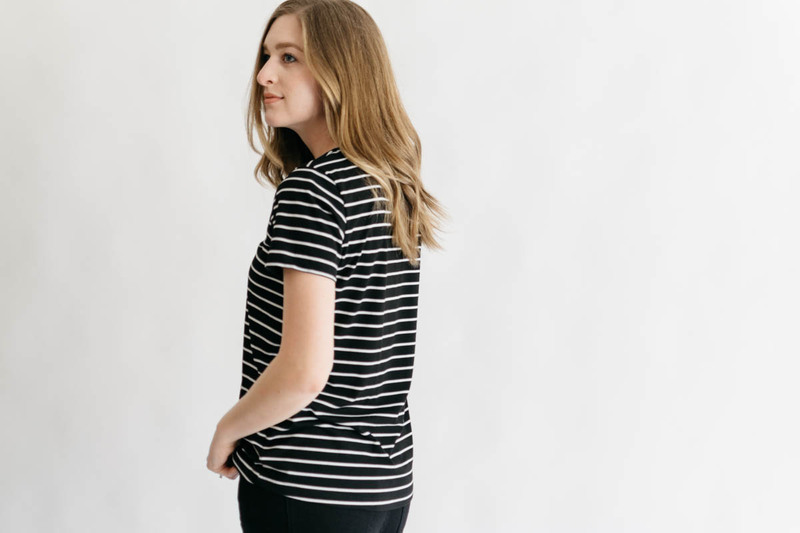 I just used the Panama Tee neckline which was a SUPER easy fix. What should you do with this fabric when there are so many options? Take a look at the things you have saved to your Instagram, Pinterest, or screenshots on your phone. Next, think of what patterns you already love that are similar. Then make those, so that you can wear this fabric as much as humanly possible, because you’re going to want to! 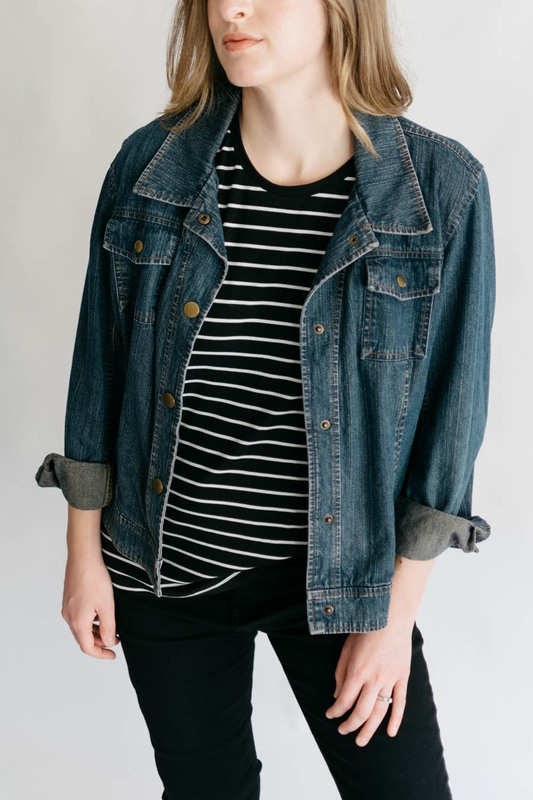 If you were lucky enough to snag some of this fabric already, I hope this has helped you brainstorm a little, or enables you to buy some of the black stripe jersey so that you can wear it too! 😉 I’m definitely looking forward to seeing what all of this fabric gets made into. Happy b&w stripe sewing! 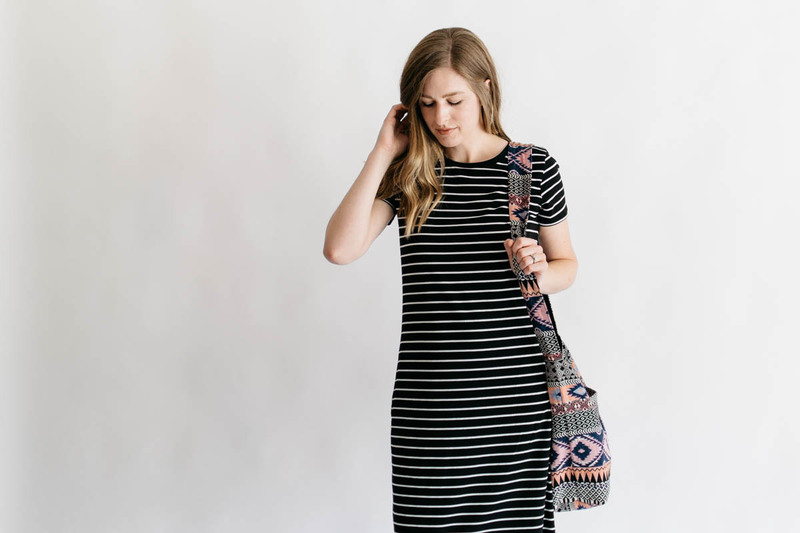 Additional Info: My gorgeous bag is the Zuri Crossbody by Trades of Hope. I learn about them in January and bought this bag and the Earthbound Wallet, and I have used BOTH everyday since. I love that the bag zips shut, has a pocket on the inside, a long strap, and the pocket on the outside is where I put my phone and keys so they don’t get lost in the bag. It works perfectly for me on outings with my two year old. 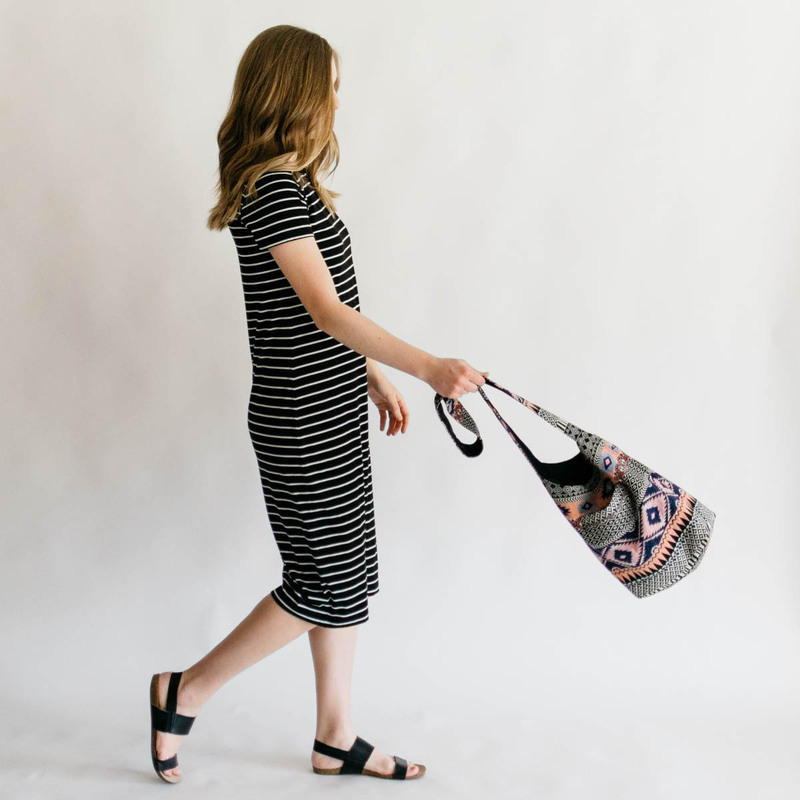 The money I spent on it helps support and empower women in India, so if you are looking to support women around the world AND don’t want to add a bag to your sewing list, this bag or any others that they have would be great. Ahh!!! 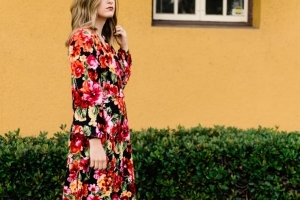 They are so good, and I love the way you styled everything! Thank you, Skyler!!! I love how they turned out and I’m glad you like them too! This fabric is seriously about as good as it gets in knit fabric retail.